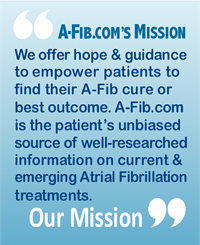 Your first experiences with Atrial Fibrillation have changed your life in a number of ways. As a former A-Fib patient (cured since 1998) I highly recommend these items when first diagnosed with this beast called ‘Atrial Fibrillation’. Most A-Fib patients are deficient in Magnesium (Mg). While Magnesium (Mg) is one of the main components of heart cell functioning, it seems to be chronically lacking in most diets. One form of easily absorbed magnesium is Magnesium glycinate, a chelated amino acid. Look for the label ‘Albion Minerals’ designed to limit bowel sensitivity. Dosage: 600-800 mg daily in divided dosages (meals and bedtime). Read more about Magnesium. Just like magnesium deficiency, A-Fib patients are usually deficient in Potassium as well. We recommend the powder in order to take the recommended dose of 1600-2400 mg per day. Be cautious of potassium tablets. For example those listed as 540 mg ONLY contain 99 mg of Potassium. Read more about Potassium. 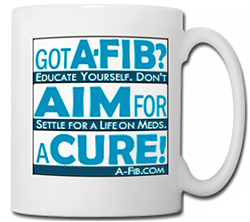 A-Fib can be cured! 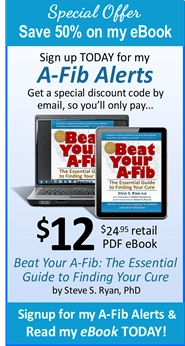 That’s the theme of this book written by a former A-Fib patient and publisher of the patient education website, A-Fib.com. Empowers patients to seek their cure. 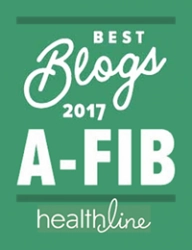 Written in plain language for A-Fib patients and their families. Many A-Fib patients want to monitor their heart rate when exercising or doing strenuous tasks (mowing the lawn, moving equipment, etc.) This is a basic DIY model with a clear, LARGE number display of your heart rate (as a number). Requires wearing the included T31 coded transmitter chest strap. One-button start. Includes a FT2 Getting Started Guide. Also look at other Polar models: FT1 & RS3000X. I wore a Polar monitor when I had A-Fib, so it’s my brand of choice, but there are many other good brands. Many A-Fib patients also suffer with undiagnosed sleep apnea. A finger Oximeter is an easy way to check your oxygen level. A reading of 90% or lower means you should talk to your doctor as you may need a sleep study. An excellent medical dictionary, the best I’ve found for patients with Atrial Fibrillation who are conducting research into their best treatment options. Includes occasional illustrations (for fun check p. 276 for the types of fingerprint patterns). 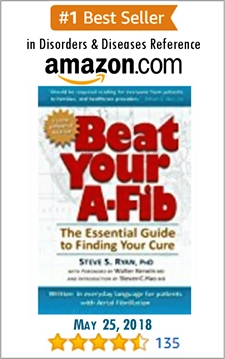 For more suggestions, see my Amazon.com ‘Wish List’ By a Former A-Fib Patient: My Recommended Products. After being diagnosed with Atrial Fibrillation, it’s helpful to talk with someone who knows what you are going through, someone you can turn to for advice, emotional support, and a sense of hope that you can be cured. That’s the role of our A-Fib Support Volunteers. 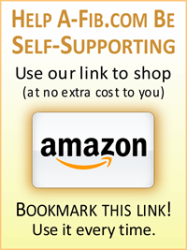 They offer you support and encouragement through exchanging emails and sharing their stories. (Not all Support Volunteers are ‘cured’ of their A-Fib, but have found the best outcome for their situation.) Learn about our world-wide network and how to contact one or more of our volunteers.